First gather your materials and lay down a Trimaco 6 x 8 One Tuff Dropcloth to protect your surface and make clean up a breeze. You’ll thank us if you choose to add glitter to your cards. Next, plan out what you want your card to look like. We went for less traditional card shapes, such as a hearts and circles. Sketch out your shape on the Heavy-Weight Red Rosin Paper, and then cut with scissors. An easy heart shape can be made by folding a piece of Red Rosin paper in half, and then sketching and cutting out a half-shaped heart. Tip: If your shape rolls up on the edges, feel free to use a piece of tape to secure the sides down. Once you are pleased with the shape of your heart, let your creativity kick in. We used doilies, stickers, glitter, glue and markers to decorate our cards. 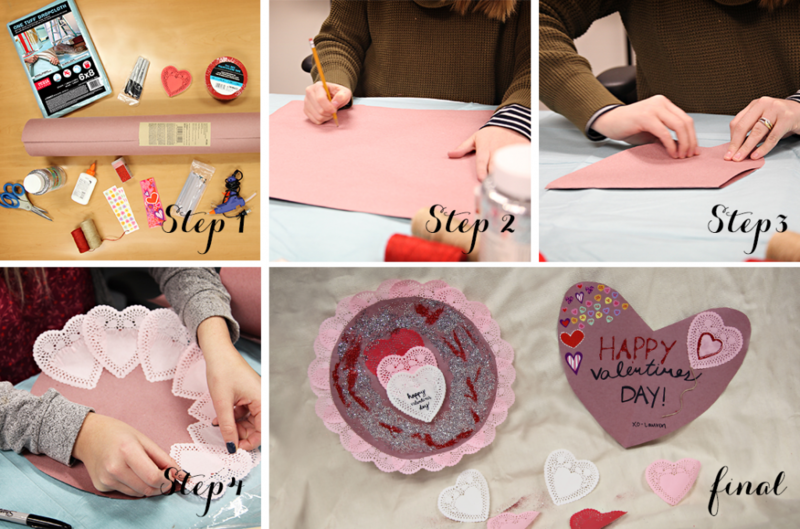 Once the cards are dry: sign, seal and deliver your valentine to a friend or loved one. Since permanent markers will bleed through the Red Rosin Paper, we suggest using colored art markers, colored pencils or crayons. Make sure you plug in your hot glue gun at the beginning of your project, so it is ready to go when needed! Make sure your valentine’s day cards dry completely before folding and delivering.